Frost Salts are dropped by frost atronachs. 4 frost atronachs can be found in and around the Chill (Winterhold's prison). It is far northeast of Winterhold. Can also be found by committing a crime in Winterhold. Frost salts are dropped by both frost atronachs and frost thralls. 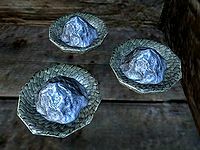 Dravynea's Frost Salts: Find some frost salts for Dravynea the Stoneweaver. 1 sample is needed for this quest. During this quest, you are asked to deliver Farengar's frost salts. They are the same item with a different name. Frost salts are needed at the Atronach Forge to create various frost atronach-related items, namely: a hostile frost atronach, a Scroll of Conjure Frost Atronach, a Staff of the Frost Atronach, or a Spell Tome: Conjure Frost Atronach. (DG) Once certain schematics are discovered during the Ancient Technology quest, one pinch of Frost salts is required for crafting a lot of ten of the Exploding Steel Bolt of Ice as well as for creating a lot of ten of the Exploding Dwarven Bolt of Ice at the Gunmar's Forge. This page was last modified on 9 April 2018, at 04:28.